The Print dialog box opens for the printer that is set up as the default printer on the system. 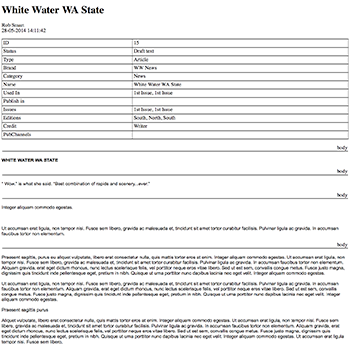 The HTML version of the article shows a section of metadata at the top (print date, article ID, Workflow Status and so on), followed by the content of each article component. 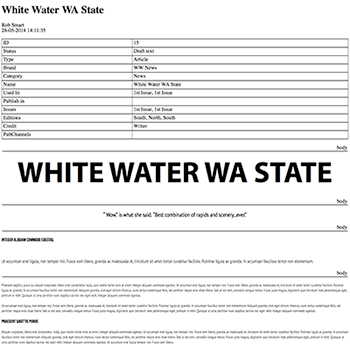 The text is styled using the formatting that is applied to the text. Enabled: the text formatting is applied as much as possible. Not enabled: the text is shown in plain formatting with additional support for bold and italic. Figure: A print preview with the Visual Mode enabled (showing the original formatting) and the same article previewed with the Visual Mode disabled (showing default formatting).